Despite Man City blitzing the league last season, we have kept the requirements all the same. In fact, even though Manchester City did get 100 points, they got 18 points extra than what they needed. Second place Man Utd had 81 points. 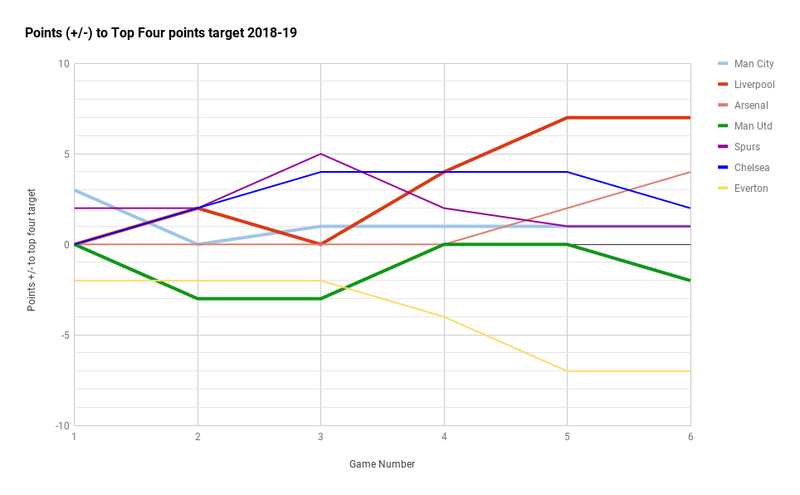 (And after six games of the season our graphs support this). Opposition difficulty, as ever, is based on the end of season league position. Wolves come in as difficulty 18, Cardiff at 19 and Fulham at 20 - as usual. Win your 15 easiest games at home. Draw your hardest 4 (Last seasons top 4). Win your 11 easiest games away. 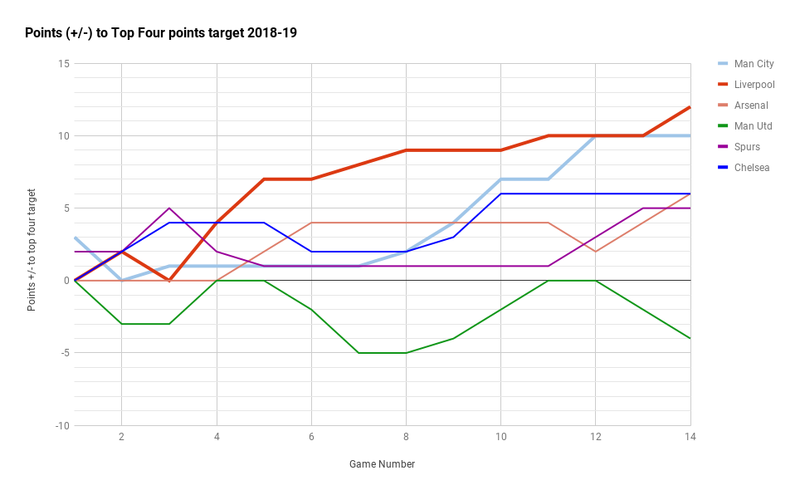 Draw your next hardest 5 (For us, last seasons 5th to 9th) . Defeated at your hardest 3 (Top 3). A current score of 0 or above suggests you are on course for the title - below that suggests you are outside title form. Win your 8 easiest games away. Draw your next hardest 5. Defeated at the hardest 6. A score of 0 or above suggests you are on course for a top 4 spot - below that suggests you are outside top 4 form. Six games into last season it didn't look good for the reds. We were already 2 points below title form, and Man City were 2 points above it (an effective four point gap). Liverpool have a technical 5 point advantage over Man City based on opposition faced (compared to 2 in the current table). Man City are showing title form (+/- 0 points) but the reds are currently beating expectations of a title winning side. The Leicester away win was 2 points better than expected. The Spurs away win being 3 points better than expected. Another solid showing from Liverpool. The extra two points comes from the win away at Crystal Palace - a draw there would have been an expected result for a team in 4th position. Arsenal here worth noting as they might be under some people's radar. Quick mention on Watford. +1 for the title and +2 for a top four. Good results against Burnley (A) and Spurs (H), but two poor results against Man Utd and Fulham. Which team has the worst results? It's actually none of the bottom 3 in the league. It's 16th placed Burnley. They have already been beaten by two of the ex-Championship clubs. 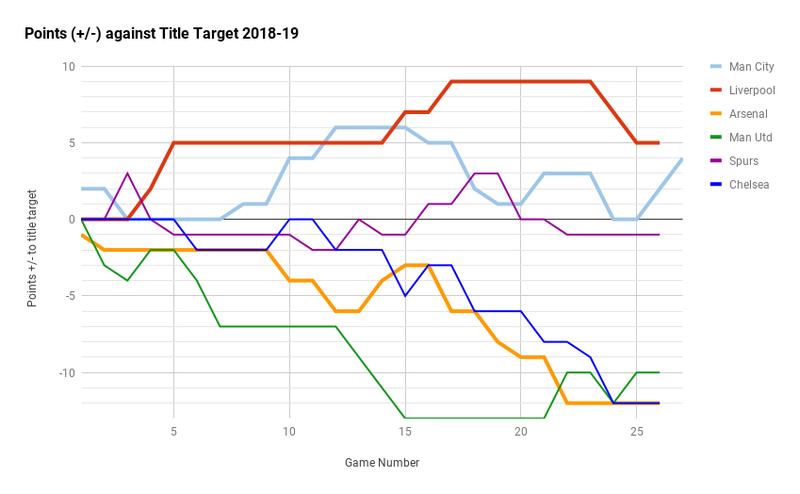 They are on -12 (title) and -11 (top four) which is slightly worse than the next worse - Cardiff City (-12 and -8). Everton, like Burnley, are another team who the real Premier League table makes them look better than they've done. Based on opposition played so far their results have them closer to 16th place than the 12th they are currently in. This needs an update - apologies, had some sh*t to deal with. Five games on from our last update, how are we getting on? In those five games we've had Chelsea and Arsenal away, Man City at home (all draws) and Huddersfield (A) & Cardiff (H) - both wins. Although City have clearly had one good and one great result in the past five, Liverpool are still 'doing the best'. Remember we judge all the teams against the same match difficulty. Both Liverpool and Man City are performing above the level of Champions in a typical season whilst Chelsea are also in contention. 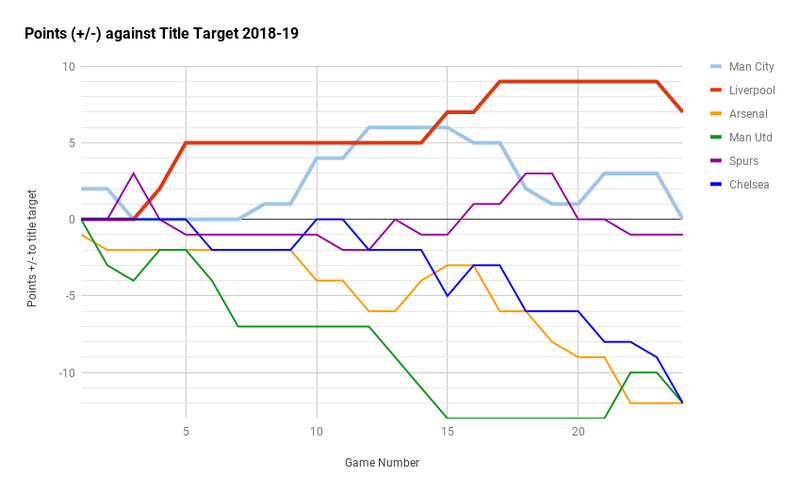 I don't think we've ever had three teams performing at this level so far gone in to the season before and it only highlights just how competitive the teams at the very top are now. Depending how this season pans out and what the final points total we may have to increase the points total. Basically, despite Liverpool not looking right on the field at times - the results are, at least for now, going very well. 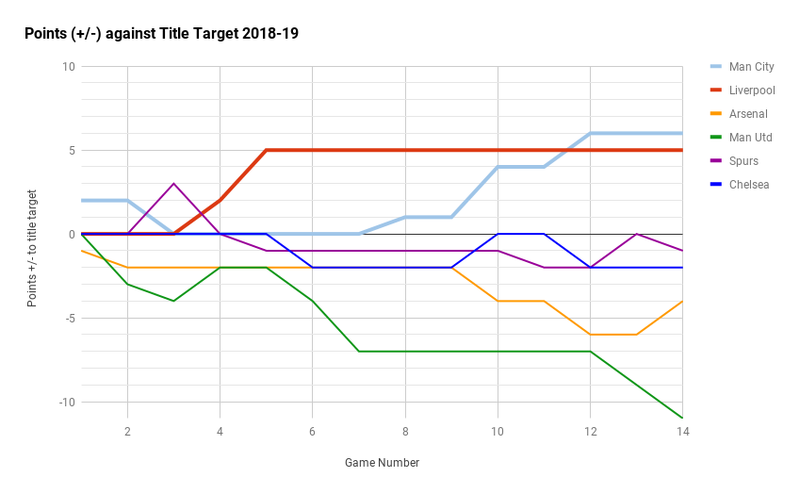 Those past 5 Liverpool results were actually better than expected for a team who want to be inside the top four so the reds gain a couple of points and again are currently the team most likely to finish inside the top four, yes even more so than City and Chelsea. Man Utd have made up some significant ground as well in the last 4 games in terms of a top four place. P.S. And just to add a little context to this - remember this - Liverpool have only played 2 home games against the bottom 7 in the Premier League. Man City have already played 5 of the bottom 6 at home. Last 3 games. In terms of a title push Liverpool have had 3 expected results (all wins) - Man City got a bonus 2 points for beating Man Utd in their identical 3 game winning run. Chelsea have slipped. Premier League title is currently a two horse race. Man Utd stretching the boundaries of our graph - after a long period of stabilising the wheels have fallen off again. Arsenal have had their first better than expected result of the season. 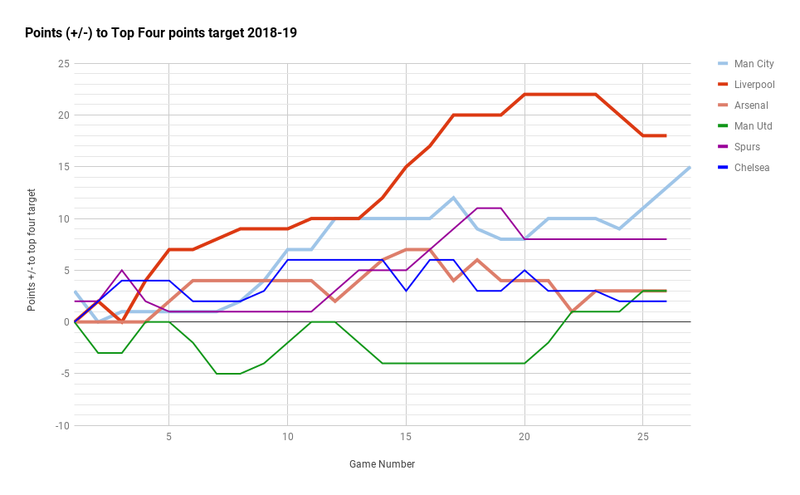 Spurs are currently 5th in the Premier League but they are doing reasonably well in this which suggests that they have had quite a difficult opening 14 games in terms of opposition. 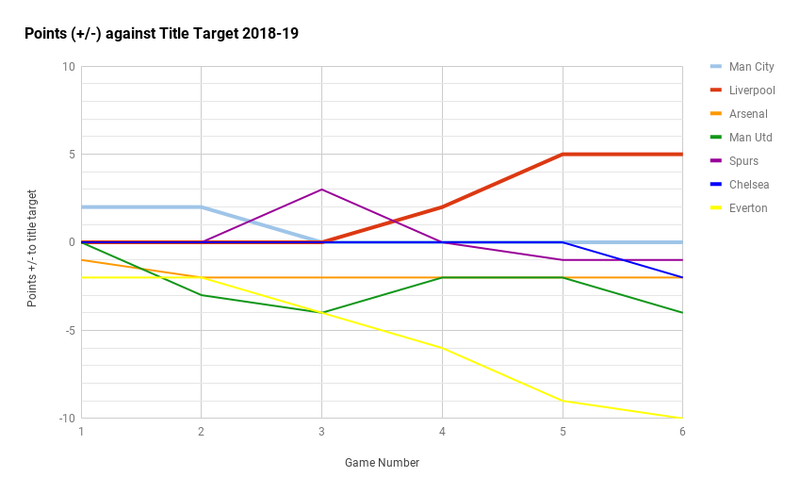 There are currently five clubs doing better than expected for a top four position. This suggests that are likely to see a much better points total for fourth place than has been the average in recent years. Arsenal and Spurs are the two teams vying for a top four spot. In terms of results, Arsenal have been in 4th spot after 8/14 matchdays - Spurs in 6/14 matchdays. Advantage Arsenal for the top four. This thread is brilliant. Looking forward to seeing how it looks after December and our recent result against City. Liverpool's Premier League lead stands at 5 points, however the pundits were correct. Liverpool do have a 'slightly' easier run in than City - but only because we've had a more difficult set of games than City so far. Based on match difficulty we are actually 7 points better than the standard usually required for Champions. Across all 24 games of the season, the draw against Leicester City was our only below par result for a title winning side. Extremely impressive results to date. Meanwhile Man City, in the past 9 games, have only had one better than expected result - beating us at the Emptihad. Man Utd have stabilised, but have only gained one point under Solskjaer - highlighting the ease of their recent fixtures. Top four race currently the most competitive it has been in terms of a potential points total. And here's a little reminder of what this analysis was saying after just the SIXTH game of the season. Man City are showing title form (+/- 0 points) but the reds are currently beating expectations of a title winning side. 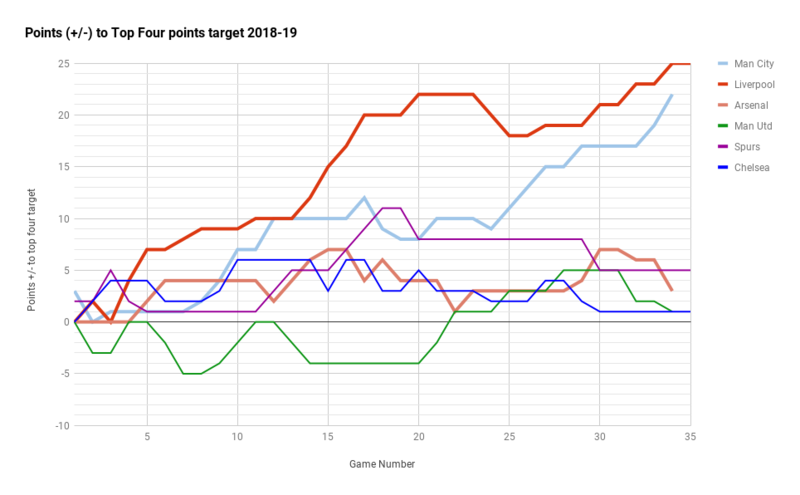 Amazing to see how through the season we have actually been consistently above City’s line. Shows how incredible our form has been given we have played nearly all of our ‘tough’ fixtures (on paper anyway). Thanks for posting JD, love reading this! v West Ham - dropped points. v Bournemouth - expected win. 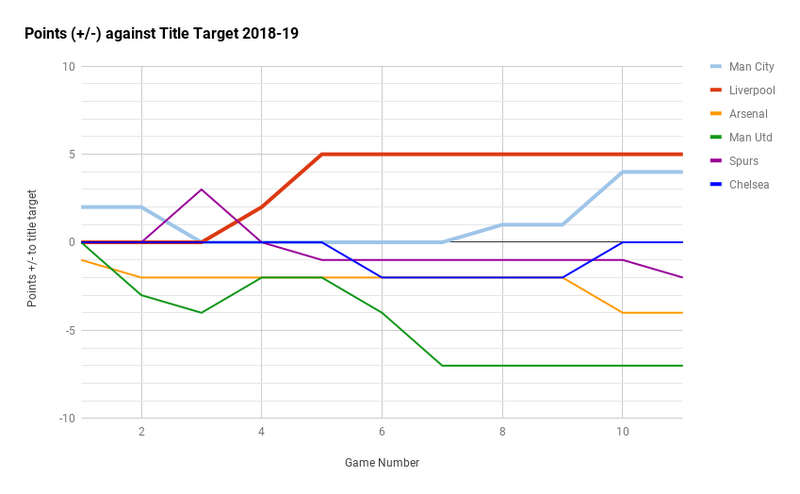 City have played one more game than the rest of the top six. 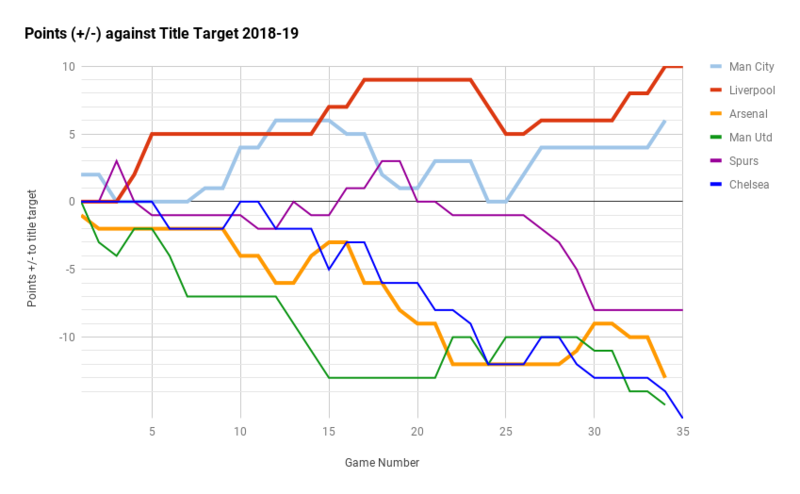 Graph suggests that Spurs have a tricky set of games still to come. Liverpool's next game is away at Old Trafford. 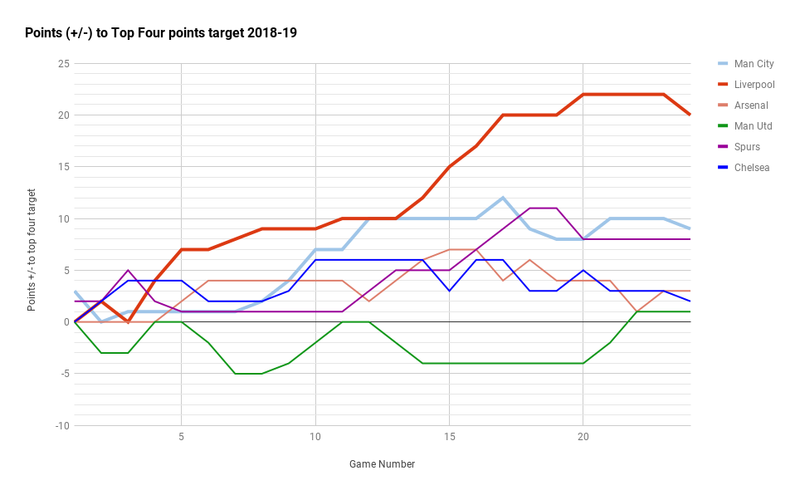 Anything from that game would see Liverpool's graph head back upwards. Brief update after the weekend's matches. Liverpool's result away at Man United was a better than expected result, statistically speaking. Psychologically it would have been looked upon like that if the reds had beaten Leicester and West Ham. It was also Liverpool's first better than expected title result since December. The reds have actually performed better than Man City by 2 points when directly comparing match difficulty. Both City and Liverpool's midweek games are expected wins though so dropping points now could change things significantly. COME ON THE REDMEN ! Title chase. City beat West Ham - expected result. Liverpool beat Watford - expected result. City win away at Bournemouth - expected result. Liverpool draw away at Everton - expected result. Exceptionally high standard to have two teams above our line for title standard, I don't think this has happened before at this stage. Spurs are in a similar slide to what happened with Man City in December. Liverpool have had the better set of results so far in the first 29 games - Man City do have the slightly more difficult final 9 games. And just to repeat, the reds have had 2 worse than expected results all season (Leicester and West Ham). Man City have had 5. Liverpool's victory over Tottenham was another 'better than expected' result for the reds in this impressive season to date. Spurs, who were even discussed as potential title winners only a month or so ago, have completely bottled it in recent weeks. Based on game difficulty, the reds have a lead over City. JD I think I get all of this except the very last bit. If we are each getting expected results (save one), how do we stay above them in the table? They play Spurs HOME and United AWAY. Presumably the calculations are done based on them (Potentially) drawing United AWAY. Possibly Burnley away too. I can't remember if we got points for beating them away - but like I said all teams' results are rated against the same level of opponent. 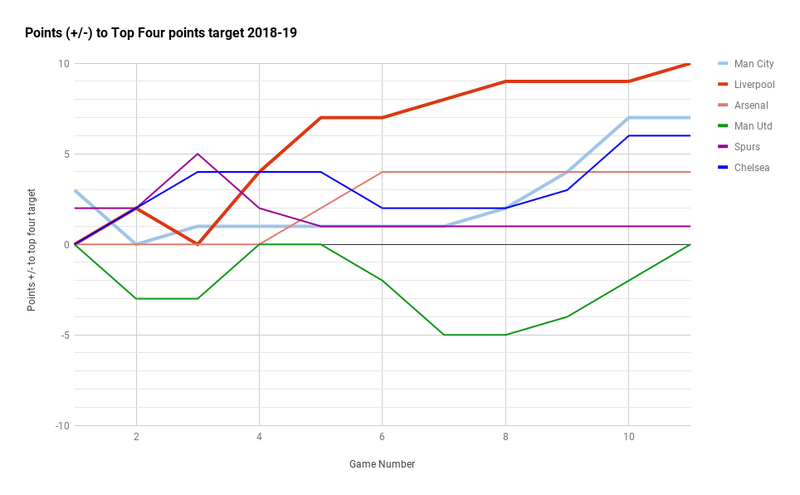 Basically we have outperformed 4 points better than them so far, but they can do better than expected in 3 remaining games whereas it may just be the one (Chelsea) for us. More potential upside for them, more potential downside for us. Toughest match on paper for LFC is Chelsea. Have a feeling it comes down to last game of the season. I think the triple header vs Spurs - including the Palace game inbeteeen is a huge ask for them. Interestingly they lost to us home and away and Utd in the equivalent period last season. It’s a lot to peak for emotionally. All in the space of about a week wasn’t it? Spuds have been impressive in the CL so far, so even if Citeh do get past them [and don't think it's a given seeing Spuds recent matches in the competition] the games should take more wind out of Citeh, than the Porto matches out of us [just going on past matches with Porto]. Certainly some big games in there within a short period. They still have the option of 6 players for 3 positions up front though. The only good thing about this is when it's mattered most this season, despite having so many options, more often than not they are relying on Aguero and Sterling. Mahrez can't get a game and then looks lack of match sharpness when he does play, Jesus is very hit and miss and Sane for as good a player he is, he can easily get lost in a game and have no impact. But they are all top class players that will walk into the majority of teams so despite what I've just said, you really can't underestimate them. It doesn’t matter how world class they are. We’ve had all the luck and they don’t. On the final stretch, it’s all that matters. Don’t forget we’ve playing sh*te but bringing home those three points. and then equalised. People choose to ignore stuff like that. Or when Kompany wasn’t sent off against us, the same game they got saved by the skin of their teeth with a line clearance. I’d say City have had just as much luck as us. Also LFC quite unlucky to be toe to toe with the most financially doped team in history. Without City Klopp's team would be cruising to the title. Luck is relative. It might decide a fins but not a season. Man City away at Man United tonight which is a big opportunity for them to get a better than expected result and cut the gap with Liverpool based on opposition faced. Spurs have stabilised their season in the last four matches, Man Utd's initial improvement under Solskjaer has turned south.